Slammers Training Academy has always followed the belief of "player first" mentality when it comes to our training and programs, and because of that Slammers has developed some of the best local talent of baseball and softball over the past several years. In a mission to continue to develop future athlete leaders, Slammers would like to share our experiences and professionalism with everyone. Slammers rich history of players moving from the High School to collegiate and professional levels has been unprecedented. 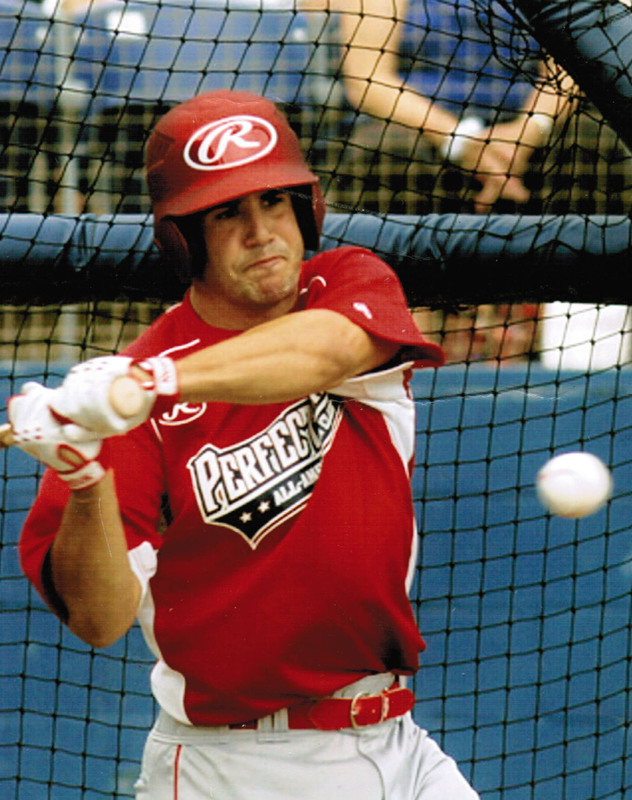 CLICK HERE for a full list of our alumni that have reached some of their goals in baseball. 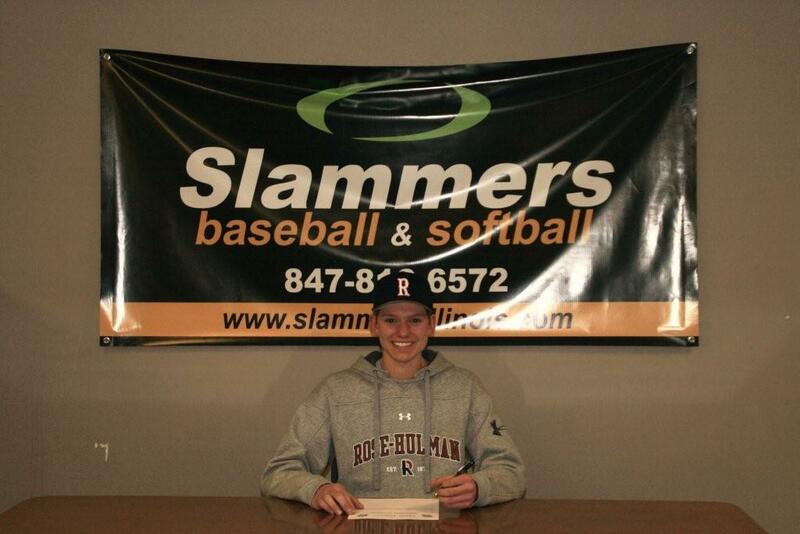 Slammers would like to congratulate players from the Class of 2014 - Lake Forest's Luke Johnson on his commitment to D1 Patriot League member Bucknell University along with Taylor Langtry from Glen Ellyn who plays for Slammers Softball Instructor Kerry Satterwhite (playing with Illinois Chill Team). Libertyville's Jimmy Govern (Eastern Illinois), Lake Forest's JR Reimers (Northwestern), Libertyville's Evan Skoug (Texas Christian University), Carmel's Ian Kristan (Bradley University), Libertyville's Noah Greenberg (Concordia), Lake Forest's Michael Szeszol (Concordia) and Libertyville's Ian Grant (Rose-Hulman) will all continue their careers. 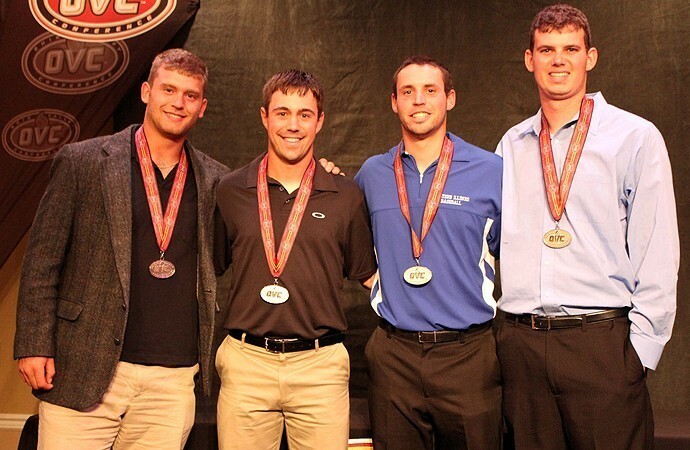 4 Eastern Illinois Players Selected to All-OVA Team! 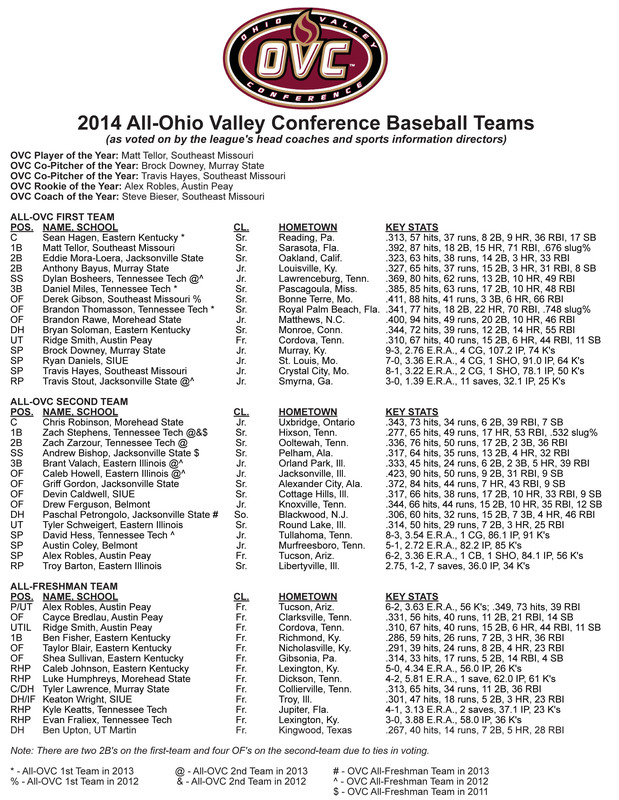 Slammers is proud of Libertyville natives and EIU Seniors Troy Barton & Tyler Schweigert as they both were selected to the All-Ohio Valley Conference Team. Barton posted a 1.38 ERA in 26 innings with 7 saves (1st in OVC) on the year while striking out 27 and only 5 walks while Schweigert had a break out year batting .314 with 29 runs and 25 RBI's. Congratulations to Ian Grant, Libertyville High School Senior, who has committed to play for Rose Hulman Institute of Technology in Terre Haute, IN. At Rose Hulman Ian will study Mechanical Engineering, they plan to use Ian as a pitcher and outfielder when not on the mound. Slammers would like to congratulate all teams that train with Slammers throughout the year on their victories and successful seasons that they are starting to wind down. 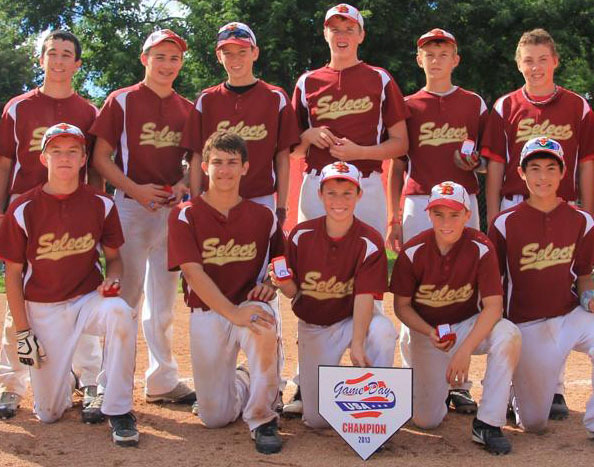 Tournament Championships carry a special feeling to those players and coaches that participated that weekend, and Slammers would like to share these pictures of our teams that won in 2013	. 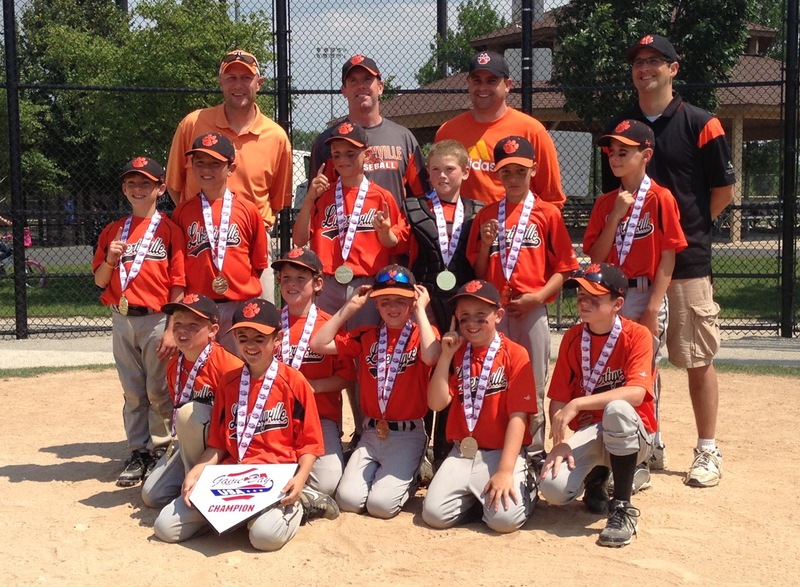 From left-to-right: Libertyville 9-Black team wins Great Lakes Championship in Vernon Hills, Select Baseball (Coyote Select) wins the GameDay tournament in West Chicago and Libertyville 12-Orange wins the MSBL Elite League Tournament in Glenview. 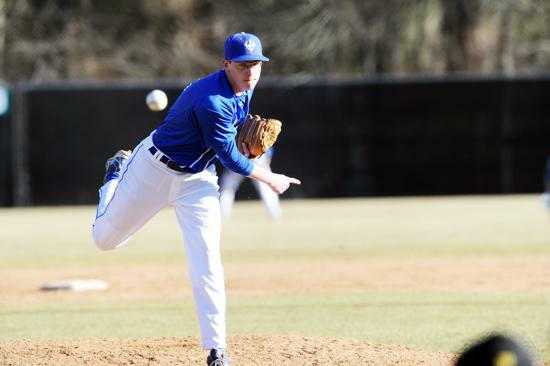 Hinsdale Central grad and Washington and Lee Freshman Tom Concklin has been impressive in his freshman campaign making 12 appearances including 7 starts and held a 3-2 record. Tom led all starting pitchers for the Generals in ERA with a 2.02 mark and was 2nd on the team in innings pitched (49) and strikeouts (24) on the year. 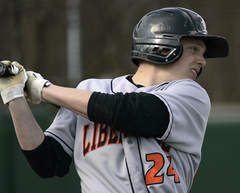 Libertyville High School senior Matt Vogt is excited to lead his team this Spring. So far, they have been to a strong start at 17-7-1 and in the middle of the 2013 conference race. Matt and his siblings, who all work out with Slammers, are dedicated to improving their own selves in an effort to lead others to do the same. Slammers would like to congratulate Matt for his leadership and hard work. CLICK HERE FOR THE FULL ARTICLE ON MATT. Slammers wants to recognize former Libertyville resident and Slammers patron Harrison Goonewardene who verbally committed to the University of Washington. Harrison works with Slammers Senior Pitching Coach Jim Sakas while visiting from his new residence near Seattle, WA. Congrats to Harrison and good luck this season and into your collegiate career! Deerfield High School's starting catcher Zach Wade has become a leader in the clubhouse and on the field for the Warriors this Spring. Not only offensively but defensively, calling the games and mentally helping his pitching staff compete - Zach is a true leader, even down to working baseball camps with 5-8 year olds at Slammers, Zach has patience and heart for the game. Slammers wishes Zach the best for this year and in future endeavors. CLICK HERE FOR THE FULL ARTICLE ON ZACH. Carmel Catholic High School senior Matt Ryan had a difficult start to his Spring, but through sticking through the tough times and working hard to get back into rotation, Matt embodies everything Slammers stands for in his dedication and support of those around him even during tough times. Being a leader isn't only by example but also by supporting those around you and achieving common goals as a team - and Matt plays his role very well. 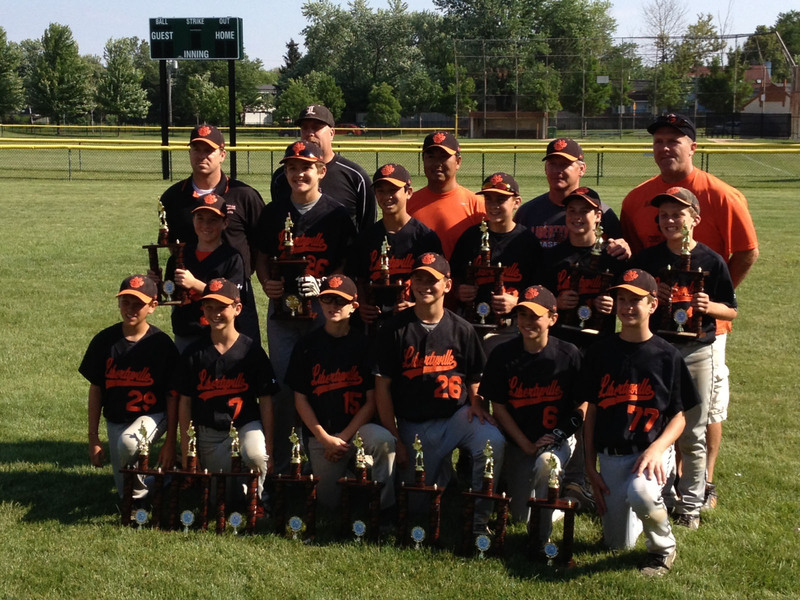 Slammers would like congratulate Libertyville HS (2nd Place) and Grayslake Central HS (3rd Place) for their performances in their Super-Sectional victories that secure them a spot in the 2013 IHSA State Tournament in their respective classes this year. 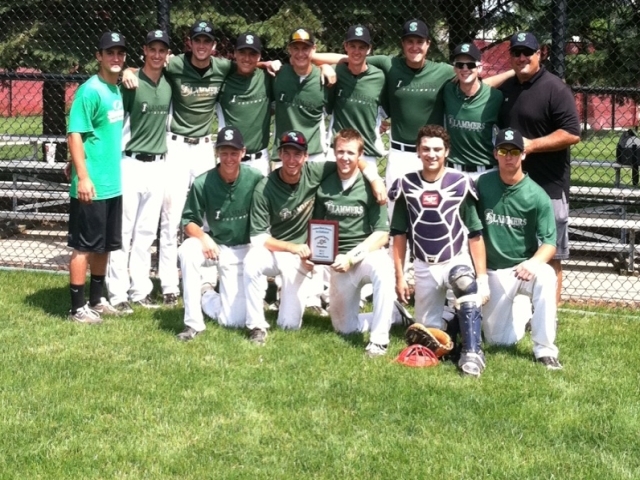 Slammers 16u - NIU INVITE Champions!! We would like to congratulate the Slammers 16-U Summer Team as they captured the Championship at the Northern Illinois University Invite last weekend in DeKalb, IL. Defeating the Illinois Indians 7-5 in the Championship Game, this coming off of last weekend's 2nd place finish in Kenosha. Slammers Congratulates Class of 2013 Commitments! Slammers would like to wish all HS seniors good luck in their collegiate years. Slammers would also like to congratulate the following players for their recent commitments to where they will begin their collegiate baseball careers next year. 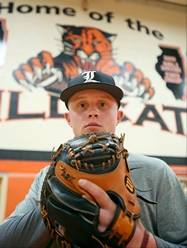 Libertyville High School Junior Evan Skoug has worked countless hours on the mental and physical talents over the last 2 years. Now LHS's Captain (youngest in over a decade) on the Diamond is doing great things on the field because of his work off the field. Slammers wants to congratulate Evan for not only getting honored for his leadership among his peers and coaches but also for his dedication to the game. CLICK HERE FOR THE FULL ARTICLE ON EVAN. Slammers would like to wish good luck to all the teams that have advanced through the Super Regional Tournaments this past weekend. NC State, UCLA, UNC, LSU, Louisville, Indiana, Mississippi St. and Oregon St. have all punched their tickets to this year's Men's College World Series in Omaha which begins bracket play on June 15th, 2013. Special congrats to Slammers student (Barrington HS graduate) Ricky Alfonso and the rest of the Indiana Hoosiers Men's Baseball team for advancing to Omaha by sweeping FSU in the Super Regional last weekend! IU is the first Big Ten team that has advanced to Omaha since Michigan did it back in 1984. Slammers wishes good luck to Ricky and the boys in Omaha! 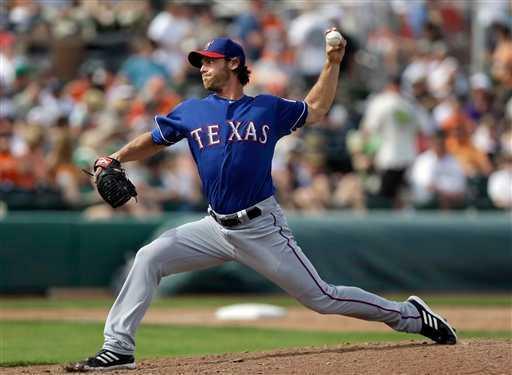 Slammers instructor Neal Cotts was picked up by the Texas Rangers for Spring Training. Neal is competing in the final grouping to make the big league roster for Opening Day 2012. Neal played for 7 years in the big leagues with the Chicago White Sox and Chicago Cubs, enjoying his finest year as a professional in 2005 when he was a part of the White Sox World Series Team. University of Illinois Freshman Catcher Jason Goldstein has been the starter for Illinois, making him the first freshman to start the first game of the year at catcher since Brian Schullian in 1992. The Highland Park High School grad was ranked as the No. 4 catcher in the country and the No. 71 prospect nationally in the high school class of 2012. Jason and his older brother Tyler have been members of Slammers since its inception and one of the mainstays with Slammers Senior Hitting Coach Ray Borucki, who also coached him. Slammers would like to congratulate Ryan Borucki, son of Slammers Instructor Ray Borucki for getting drafted in the MLB Amateur Draft out in High School this Summer. 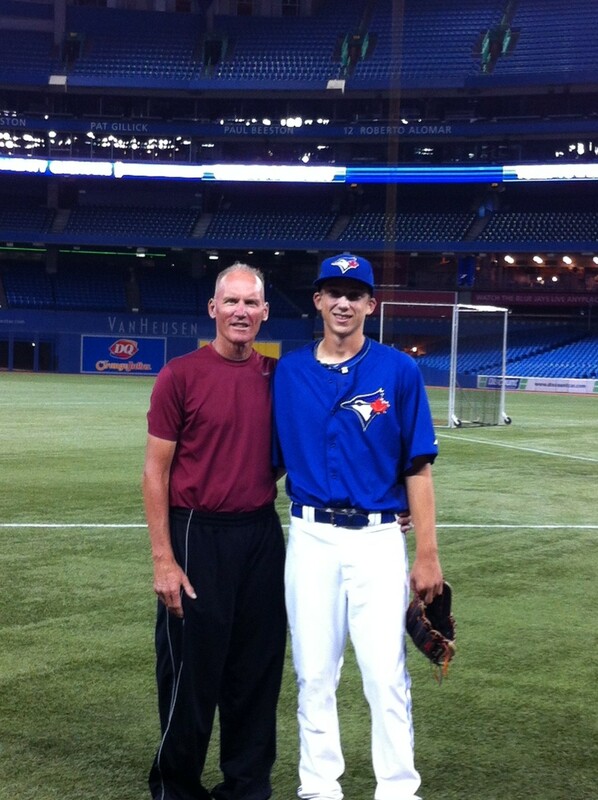 Pictured to the right is Ryan and Ray on the field of the Rogers Centre in late June 2012 after the draft. 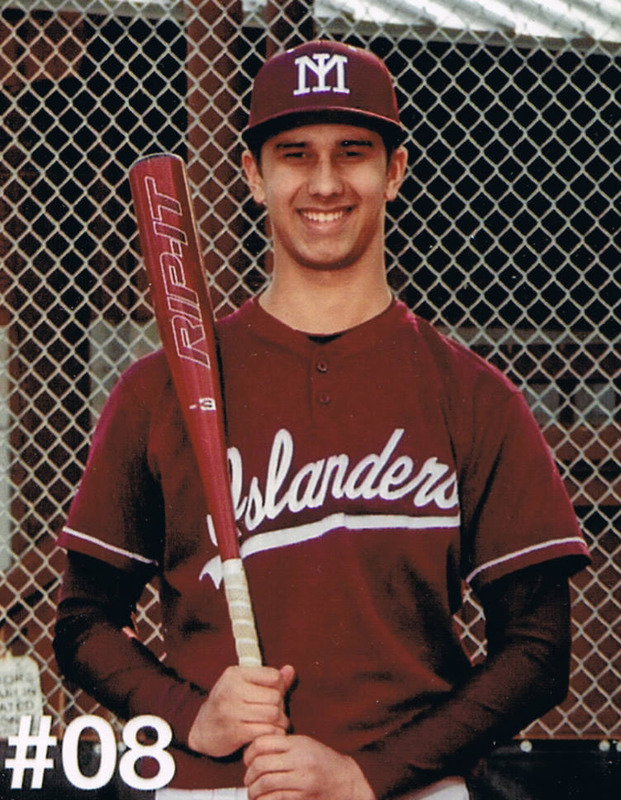 Ryan has enjoyed a great career at Mundelein HS, and Slammers wishes Ryan a continuation in success along the way to a long future in the professional baseball. Ryan has been involved with travel teams and workouts at Slammers since he was a young athlete and now he is involved with giving back to the community through baseball with coaching local youth players and travel teams. Slammers Training Academy Co-Owner Ed Tolzien was invited to spend the weekend alongside of current Chicago Cubs Hitting Coach Rudy Jaramillo in Dallas, TX. Rudy Jaramillo has worked with some of the best hitters currently in the Major Leagues. His simple 5-step approach has helped players like Jeff Bagwell, Alex Rodriguez, Michael Young, Josh Hamilton and Starlin Castro. Jaramillo has spent 15 years with the Texas Rangers and 2 years with the Cubs with 17 of his players winning the Silver Slugger Award and 3 MVP Awards under his guidance. 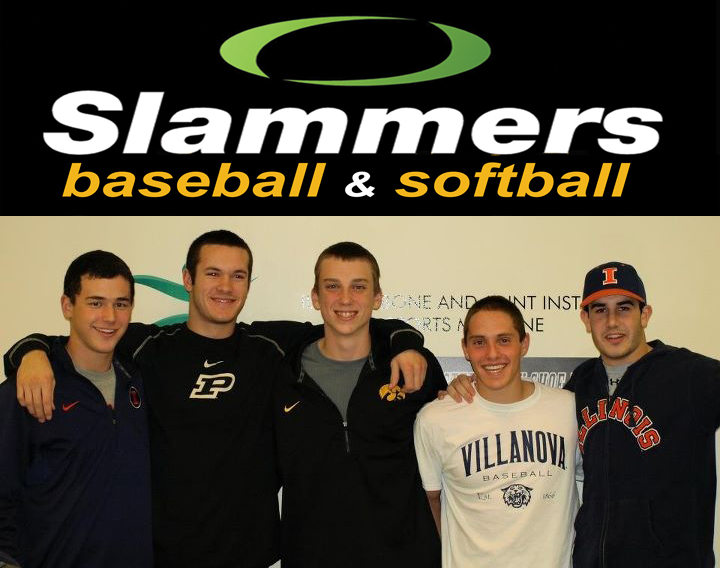 Slammers Training Academy congratulates all high school baseball players that made the Lake County All-Area First Team, including Slammers Clients: Chris Marras (All-Lake County Captain - Vernon Hills HS), Pat Kenney (Warren HS), Adam Walton (Stevenson HS), Chris Maranto (Mundelein HS), Anthony Mack (Libertyville HS), Max Golembo (Stevenson HS), Adam Gomski (Grayslake North HS), Tyler Feece (Vernon Hills HS) & Jon Gurchak (Grayslake Central HS). Great Job & Good Luck this Summer! Slammers would like to congratulate those teams that have moved onto the super-sectionals after the games this weekend. Local teams like Highland Park HS (7-3 win), Grayslake Central HS (4-0 win), Grant HS (5-2 win) & Schaumburg HS (11-1 win). Good luck to teams during their Super-Sectionals! 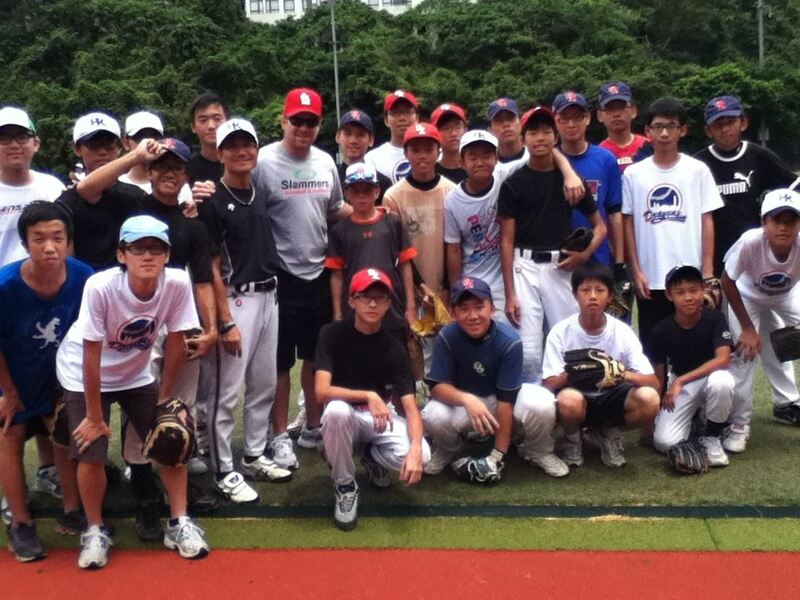 Slammers Training Academy's own Gary Bennett visits Hong Kong along with other former MLB players to work with the local kids on fundamentals of Baseball. Gary played for 13 years at the Major League level and enjoyed a lot of success throughout his career. Gary was on the St. Louis Cardinals on the 2006 Championship team that won the World Series over the Detroit Tigers. January 31, 2010 - Slammers Training Academy hosts Ripken Baseball Camp conducted by Hall of Fame Member Cal Ripken Jr. and 13-Year MLB veteran Billy Ripken. Select local travel teams participated in this all-day baseball training camp held at Slammers Training Academy in Lake Forest. July 2009 - Slammers Training Academy along with Chicago Cubs & 2008 MLB All-Star Pitcher Ryan Dempster came together for a Summer Camp held at Butler Lake Fields in local Libertyville, IL. Slammers conducted a 4-Day Skills Camp for the community and hosted a question & answer session and allowed players meet and greet with a Major League player and 2008 All-Star. 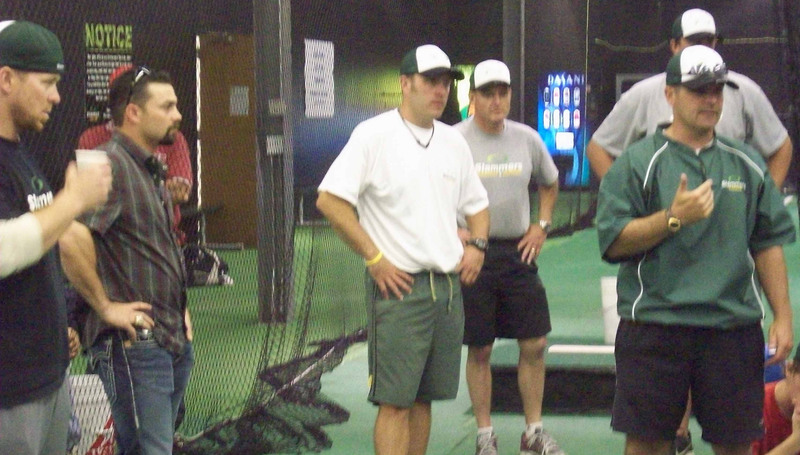 June 2009 - Slammers Training Academy teamed up with new partners Illinois Bone & Joint along with Chicago Cubs player Aaron Miles for a Summer Camp held at Slammers in Lake Forest, IL. Slammers conducted a 4-Day Advanced Skills Camp for the community and hosted a question & answer session and allowed players meet and greet with a 7-Year MLB Veteran.